A roundabout at Highway 142 and Highway 45 that the Wisconsin Department of Transportation had been saying was its preferred option for when the intersection is reconstructed has been dropped from the state’s plans. 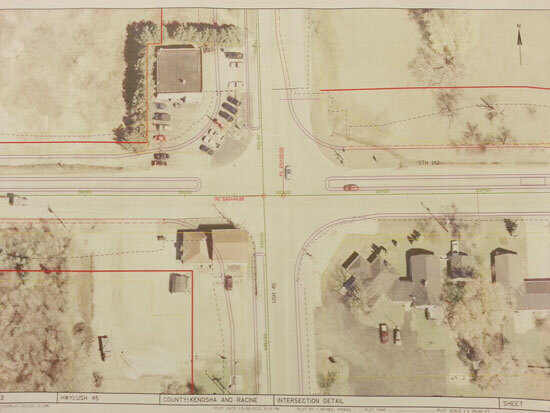 However, two businesses on the west end of the intersection are still in the way of improvements and will be removed by WisDOT and relocated by their owners, said Justin Suydam, WisDOT project manager. The roundabout was required to be considered as an alternative because of the projected traffic volume, Suydam said, but Paris government opposition to the roundabout and the existing low crash rates at the intersection resulted in an all-way stop being the ultimate preferred alternative. The project to reconstruct Highway 45 from Highway 50 north to Highway 11 was the subject of a public informational meeting Wednesday at the Kenosha County Center in Bristol. In Western Kenosha County, the highway passes through Bristol and Paris. 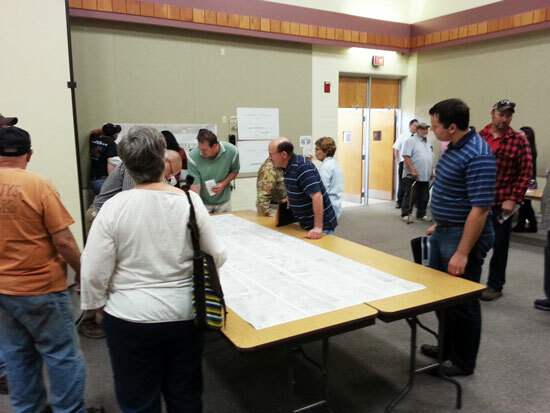 Over the first hour, a steady stream of people came in to look at maps and plans and ask questions of WisDOT officials. Many of those people were landowners along Highway 45. Plans for the other main intersection in Kenosha County included in the project showed planned improvements for Highway 50 and Highway 45. Said Suydam: The Highway 50 intersection will have the signals updated from multiple poles to a single pole. Each direction of travel will have a single pole with mast arm holding a signal head over each lane. Also, the left turn lanes on Highway 45 will be offset so the turning traffic can better see around the opposing turning traffic. Lastly, there will be shoulders added on all the roads at the intersection to improve driver visibility. Bristol village administrator Randy Kerkman, who attended Wednesday’s meeting, said he has been told that additional arrow signals also will be activated at the intersection, which he felt should help with confusion sometimes caused by past configurations. Hills will be smoothed out where possible to improve sight distances.Paved shoulders will be widen from 3 feet to 6 feet, allowing better vehicle access and improved functionality for bicycles as well. More intersections will now have right turn lanes. New ditches will be wider and more gradual, where possible. Needed real estate acquisitions will take place from later this year through 2018, but mostly occur in 2016. Plans are expected to be complete by 2019, with construction in 2022. That’s about two years later than the last time I heard a construction date on this project. 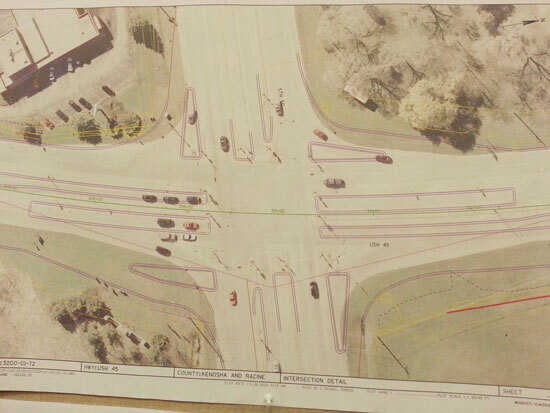 The roundabout planned for the Highway 45 and Highway K intersection is not part of this project and will be completed earlier due to safety concerns at that intersection. The Highways 45 and 142 plan. The Highways 45 and 50 intersection plan. Posted in: Bristol, Paris, Road Construction, Uncategorized.